You guys, there is SO much amazing gluten-free stuff going on at the store. Sure we can all paleo it up and eat all whole, but sometimes we need a bar, a cookie we didn’t make ourselves, and, of course, jerky. Or all of the above at once. The nice people at Liz Lovely contacted me awhile ago about trying their delicious cookies. Between travel, and general insanity, I wound up eating all the cookies and not doing what I wanted to do, which was make a gluten-free peanut butter chocolate ice cream sandwich. I also just saw this ice cream sandwich trick, and was excited to get it all going. Luckily I discovered Mrs. Winston’s sells Liz Lovely cookies so I picked up my fave—the previously mentioned peanut butter and chocolate—and got excited again. Then I dropped the cookies. Broke the cookies. 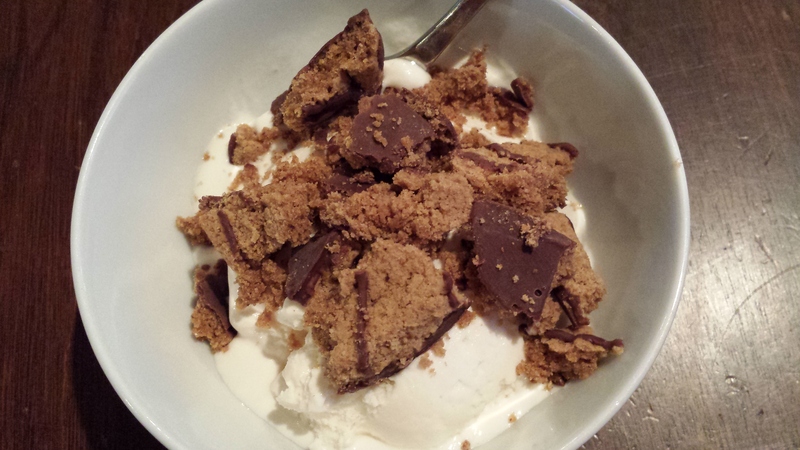 I decided that rather than wait another six months to remember to buy a cookie, get a pint of vanilla ice cream, and do this thing, I plopped the ice cream in a bowl and sprinkled broken cookies over the top. Not as amazing looking, but just as unbelievably good. So, yeah, Liz Lovely makes some good gluten-free cookies, you guys. Soft, in many flavors, and delicious with ice cream. Oh, yum. We demolished these bags of Brazi Bites in our house. The jalapeno was the fave, with bacon being a close second. 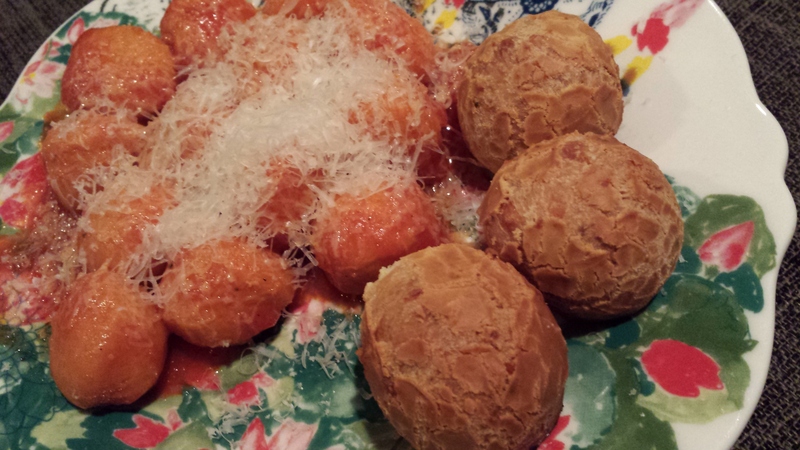 My favorite thing to do with these gluten-free lumps of joy is to serve alongside a gluten-free sweet potato gnocchi, as seen above. Honestly, these Brazilian style of bread balls make every single family member drool. We’ll be adding these to our table on the regular. First of all, this joint in Vermont has Bacon Thursday. So I was already won over before they shipped me two delicious flavors of gluten-free granola. As someone who loves granola that’s simple, not too much fruit-ness, I LOVE their nut-filled maple version. The chocolate is a super treat when you’re all, “Give me the chocolate!!! !” Which is often. Did you know that every minute 1 in 50 people are eating a bar? Okay that’s not true. But I heard some number like that and now I can’t find the info to back up the claim. So my point is, a lot of people are eating bars. And there are a lot of crappy bars out there. Skout is NOT one of those bars. 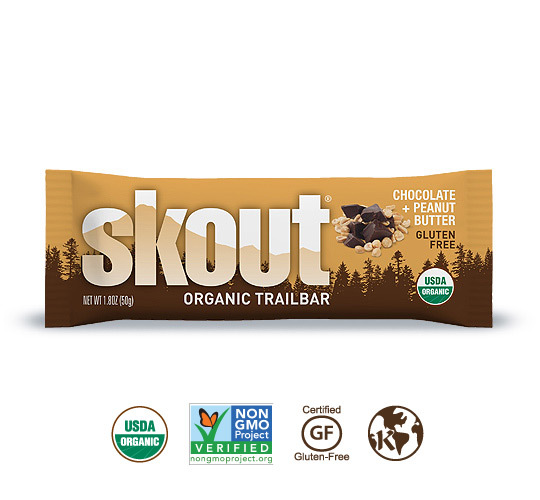 In fact, I just had one for breakfast (for the second time) and I’m feeling pretty good considering the Skouts are certified organic, gluten-free (duh-course), vegan and no-GMO. Also, they’re from Portland, so awesome. 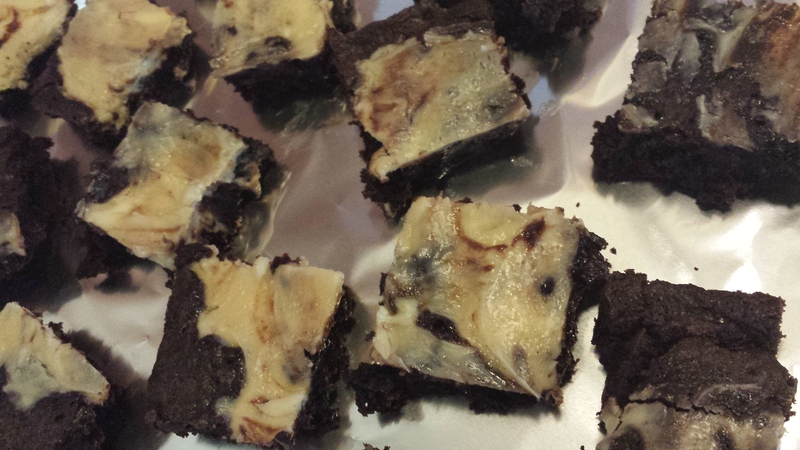 I’m favoring the Chocolate-Peanut butter trail bar at the moment. Can you see a food theme in my life? Mmmmm, peanut butter. I like to pimp my brownie mix, so I turned this Glutino box into my German Cream Cheese version. Uhhh, yum. I also brought it to a volunteer event and they were gone within seconds. So it’s one of those things you can bring anywhere and no one will know if it’s gluten-free or not. SCORE. Wow, that’s a lot of yumness with zero to small amounts of work on my part. Happy gf eating! 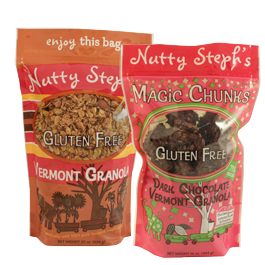 Tags: gluten free cookies, gluten free junk food, gluten-free brownies, gluten-free mix, gluten-free products. Bookmark the permalink. Have you ever tried any Chebe mixes? They’re manioc-based, like the Brazilian-style bread balls, and you can get slightly different kinds depending on what you’re after. I like to use the pizza crust one to make folded pie things with leftover stew. I’ve seen them everywhere, but have not tried. I must! The pizza crust also makes great pizza crust. One box will fill a 9″x13″ cookie sheet with a nice, crispy thin crust pizza that is ever-so-slightly chewy on the topping side. Luvverly! Thanks so much for featuring Nutty Steph’s. We’re fans of Liz Lovely here – nice to see you posted about them too. Glad you enjoyed our granola and Magic Chunks. Cheers! Your granola is so fab!